How are you all? It has been a long time since I ventured into my craft room. It is spring break here and hubby took off this week as well. It has been crazy at home. No schedule or routine what so ever. So having that free time even for about an hour is very difficult. I have not even stepped into my craft room. Hoping tomorrow I will break the famine and start to craft some thing. I started with sponging a white cardstock panel with Mermaid Lagoon, Salty Ocean, Evergreen Bough and Mustard Seed distress inks. I love the colour blend of these colours. I then die cut this panel using a stitched rectangle die. On the panel, I spattered some white Mr. Huey and sprayed some shimmer. I set this panel aside to dry. I die cut the townscape using Tiny Town die from Penny Black using black glitter cardstock. I adhered this die toward the bottom of the panel and trimmed the edges off. I heat embossed the flyinf Santa from Snow Dasher cling stamp set on the sky. The sentiment is from Season’s Gifts stamp set which I gold embossed. Then I also added some snowflakes using white pigment ink on the sky. I wanted the snowflakes to be subtle and hence I did not white heat emboss them. Once the panel is completed, I adhered it to the white card base. To tie in the gold on the sentiment, I added a gold twine with a bow on the top fold of the card base. Here is a closeup! 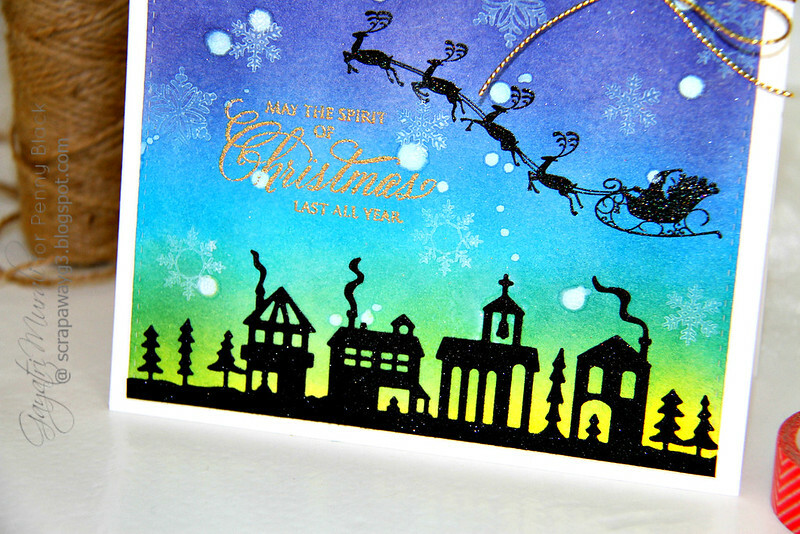 Here are all the new Christmas release products from Penny Black I have used on my card. 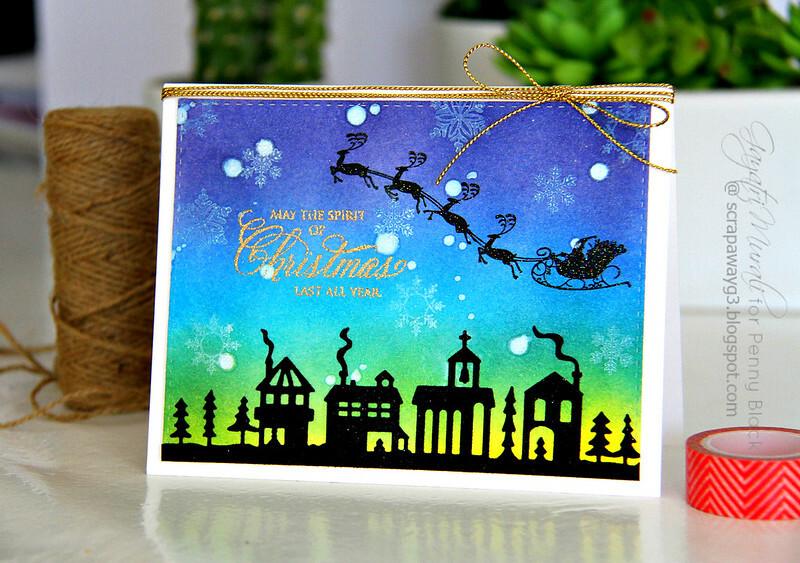 Season’s Gift and Snow Dasher stamp sets and Tiny Town die. Hope you like my card. Thanks for stopping by! Beautiful card!! Love the colors!! The silhouette is nice..